The Video 25 Plus fluid head has a seven-step, temperature-independent damping system which enables professional camera operators to capture the naked truth on film with perfect clarity. It has a tilt angle of up to 90º even under maximum load. The Video 25 Plus displays an 18-step counterbalance that can be adjusted easily and safely in 9 stages with our well-known dial. Fine tuning is achieved via a half step function which can either be engaged or disengaged. The self illuminating Touch Bubble, which runs on conventional batteries, helps you level the camera even in poor lighting conditions. With a maximum payload of 35 kg / 77.2 lb, the Video 25 Plus is ideally suited to HDTV and wide screen cameras, as such a viewfinder extension bracket is included as a standard accessory. Sachtler 7003 SP 100/150 heavy duty rubber spreader for all Sachtler tripods with 100/150mm bowls except for tripods DA 100K and DA 150 K.
This cover is recommended for Video 18/20 on tripod Speed Lock® CF HD with ground spreader; Video 25 Plus on tripods EFP 2; tripod OB 2000 with spreader, without fluid head. 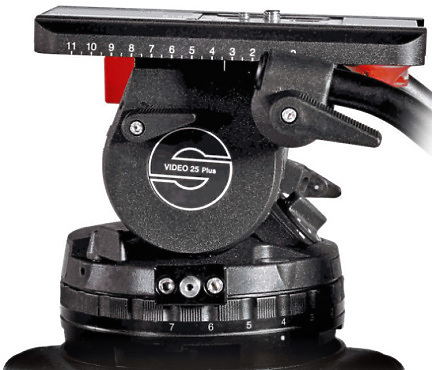 Hire the Sachtler Video 25P Head 150mm bowl from Procam. Best service and rental rates for the Sachtler Video 25P Head 150mm bowl and all cameras, lenses, sound, lighting and grip.